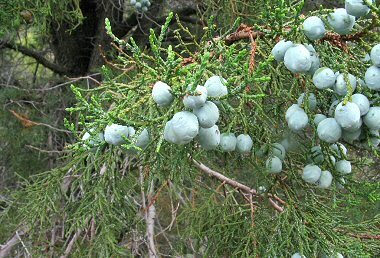 The Alligator Juniper is a member of the Cypress Family. It is a large tree which grows to 50 feet in height with a trunk to 4 feet in diameter. 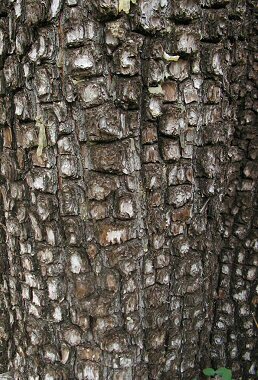 The tree is easily identified by its bark, which becomes deeply fissured with age to form squares one to two inches on a side. Needles are blue-green in color and scaly and grow to 1/16 inch in length. The Alligator Juniper typically grows in oak and pinyon-juniper woodlands at elevations between 4500 and 8000 feet. Alligator Juniper is also known as the Western Juniper or Checkered-bark Juniper. The cones of the tree appear as waxy grayish berries to 0.5 inches in diameter. Each cone, which provides food for some wildlife, contains 4 seeds which mature the second year after they form on the tree.